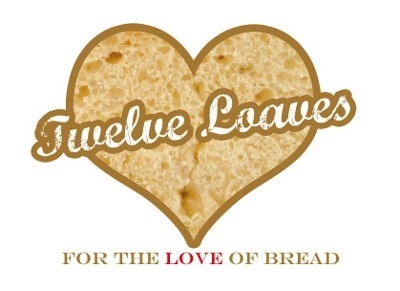 #TwelveLoaves is a monthly bread baking party created by Lora from Cake Duchess and run with the help of Heather of girlichef, which runs smoothly with the help of our bakers. Our host this month is Heather from girlichef, and our theme is Apples. For more bread recipes, visit the #TwelveLoaves Pinterest board, or check out last month's mouthwatering selection of #TwelveLoaves Pear Breads! 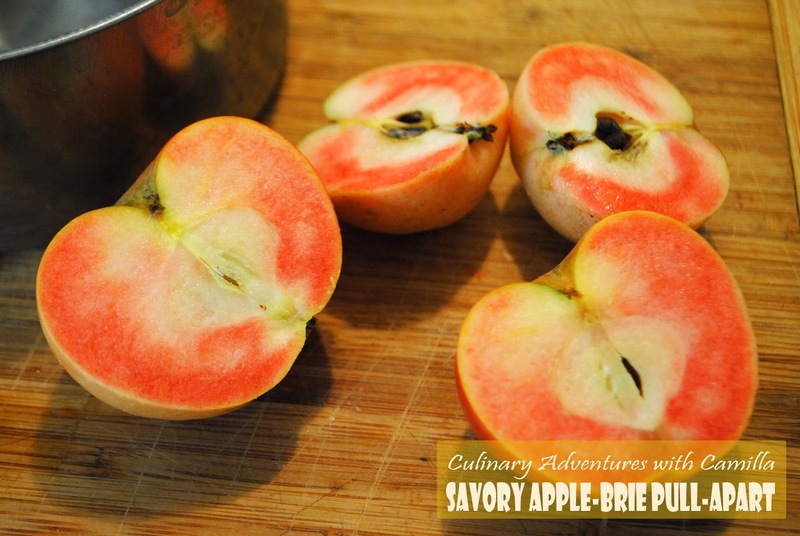 With a theme of apples, I wanted to create a savory bread with my new favorite apple, the Pink Pearl. They are so pretty! Read about my (thankfully) successful hunt for Pink Pearls last month. 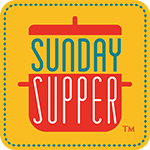 In a large mixing bowl, pour in the warm water, add in the sugar and the yeast. Let bloom for 10 minutes. While the yeast blooms, melt your butter in a small skillet. After 10 minutes, the yeast mixture should be foamy. Add in the flour, melted butter, and two eggs. 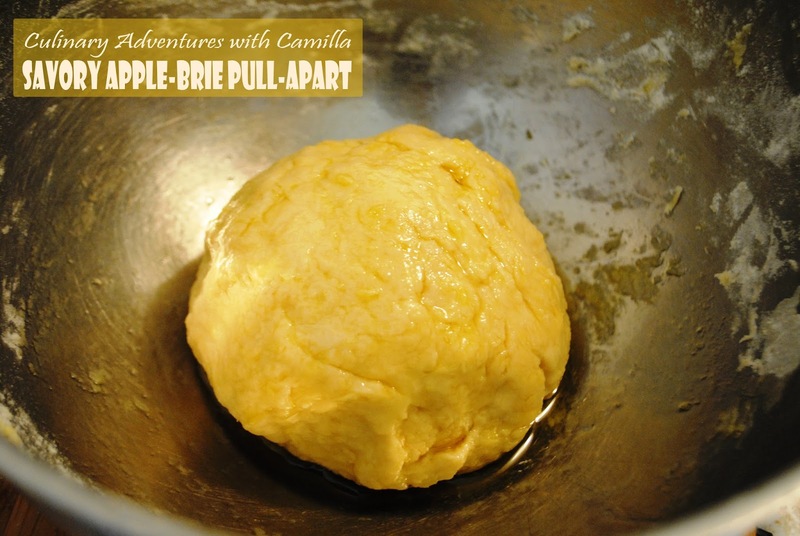 Mix with a wooden spoon until the dough comes together. Knead for 2-3 minutes until the dough is smooth and elastic. Place the dough in an oiled bowl. Cover with a clean dish towel and let rise in a warm place for about an hour. While the dough rises, make the filling. 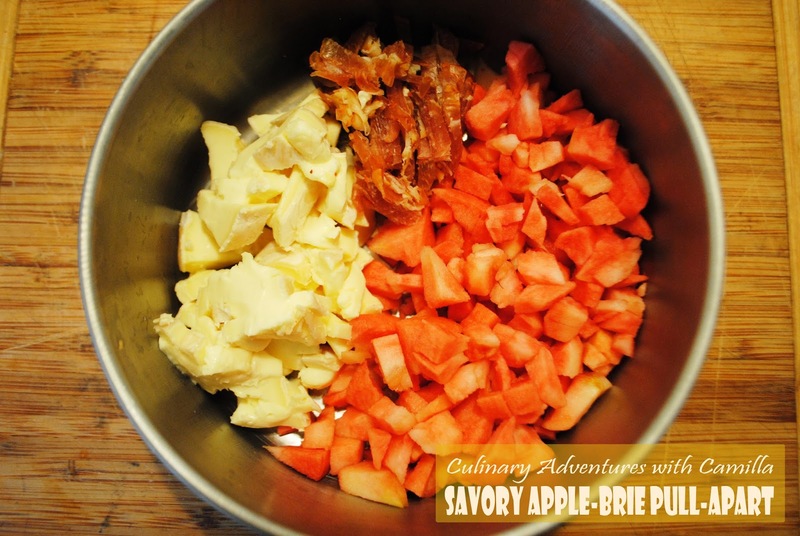 Blend together the apples, pancetta, and brie. Set aside. Butter a loaf pan and set aside. 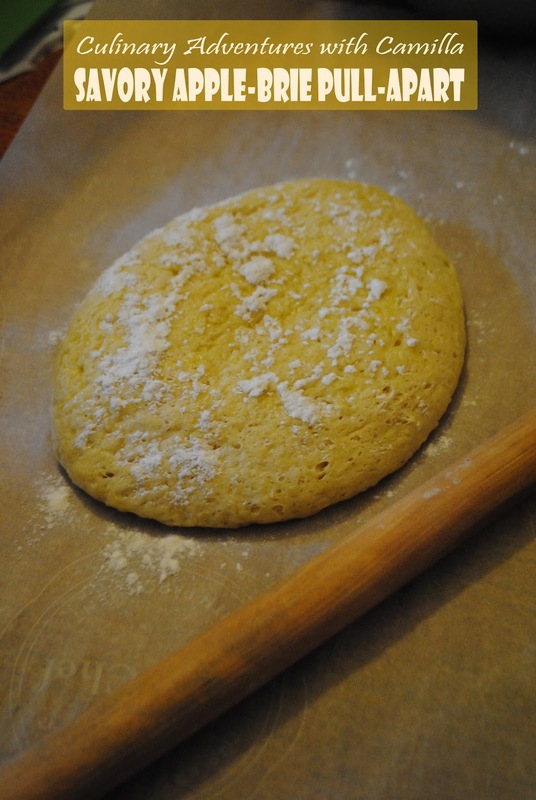 After an hour, turn your dough onto a piece of parchment paper. Dust the dough with flour and roll out to approximately a 12" x 21" rectangle. You don't have to be too precise. 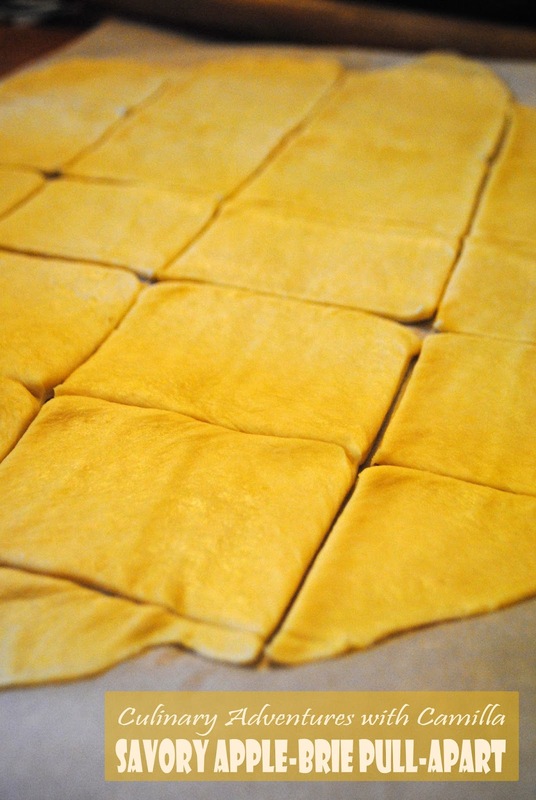 Cut the dough into approximately 3" x 3" squares. Place some of the filling into the middle of the square and layer them upright into the loaf pan. Once you've used all of the dough and all of the filling, sprinkle the loaf with vanilla salt. I had just gotten a small jar from one of my favorite bloggers: Susan who is The Girl in the Little Red Kitchen. If you don't have vanilla salt, just use regular salt. Cover the pan and let rise for 30 minutes. In the meantime, preheat your oven to 350 degrees F.
Bake for about 35 minutes until the top of the bread is a nice, golden brown. Take it out of the oven and let sit for about half an hour. Use a knife to loosen the bread and invert it onto a board or plate. Flip it back so that it's right-side up again. 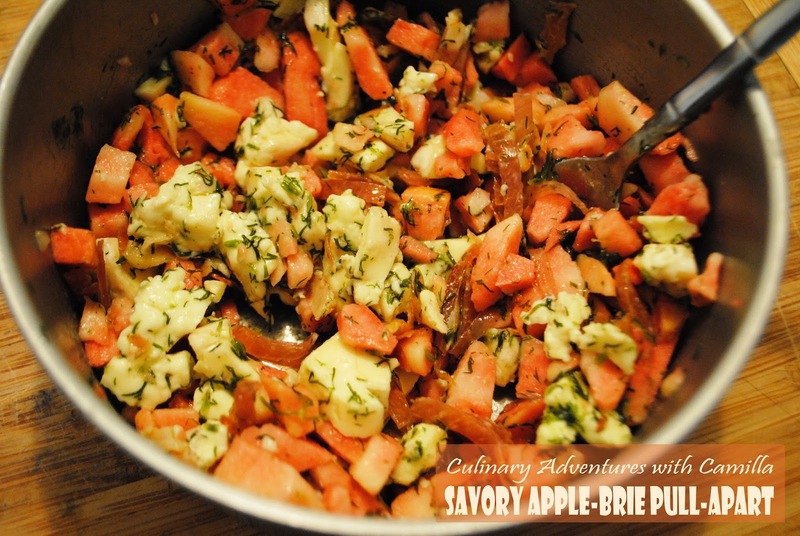 I served this with Savory Curry Apple Butter. Click for that recipe: here. Please link your post to the linky tool at the bottom of this blog. The bread MUST meet the Twelve Loaves theme (October = Apples). 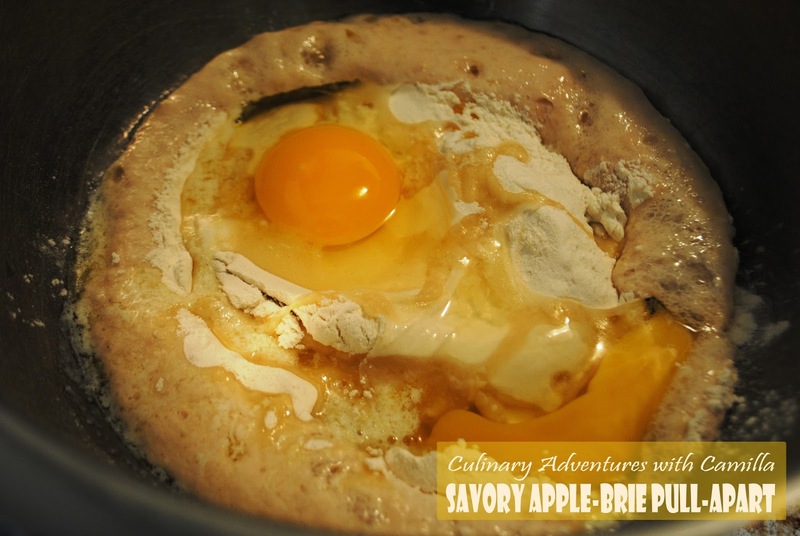 Share your Twelve Loaves bread (must be baked and post this month) on your blog by October 31, 2014. Such an interesting bread! Love the uniformity of the three inch squares of dough that morph into that beautiul layered loaf! Thanks! It was an interesting loaf. I don't know why pull-aparts have always intimidated me. No longer! Bread...brie...pancetta...apples... I can think of no combination that sounds more heavenly! This loaf would be dangerous in my hands. 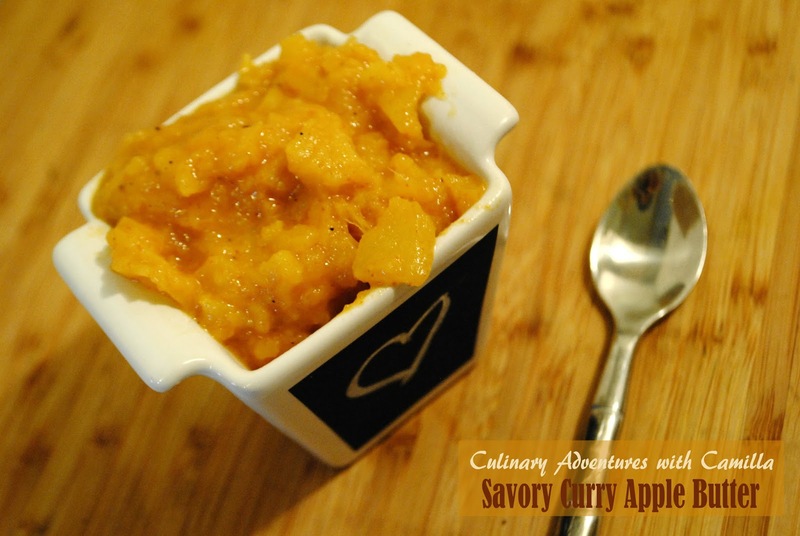 I'm dreaming about that savory apple curry butter...wow! 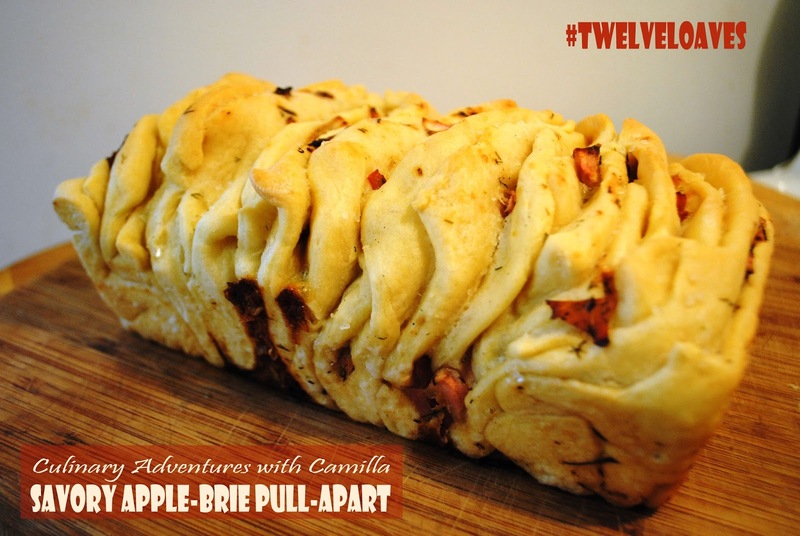 Great job on your pull-apart bread for our apple theme this month for #twelveloaves! Thank you for baking with us again! Thanks, Lora. I love how this group makes me stretch and try something new to me. 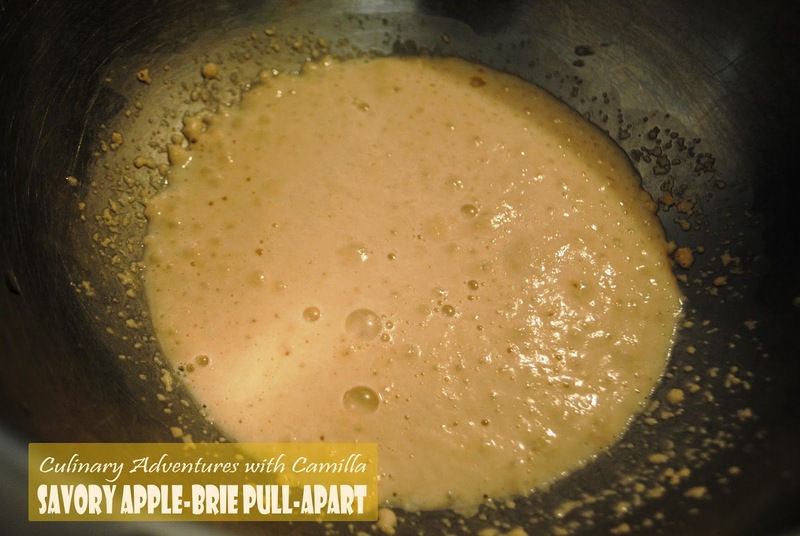 ohhhhh, brie and apples together along with curried apple butter...sounds heavenly ! Wow! 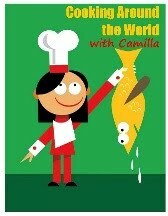 What a gourmet creation, Camilla. Brie and Pink Pearls alone sound fantastic. But baked into bread and served with curry apple butter? Oo-la-la! I know! I'm sad that Pink Pearls are no more...until next year. Oh goodness. I've not heard of pink pearl apples before but I did see you post the photo on FB and was totally intrigued. What a pretty color these apples have! 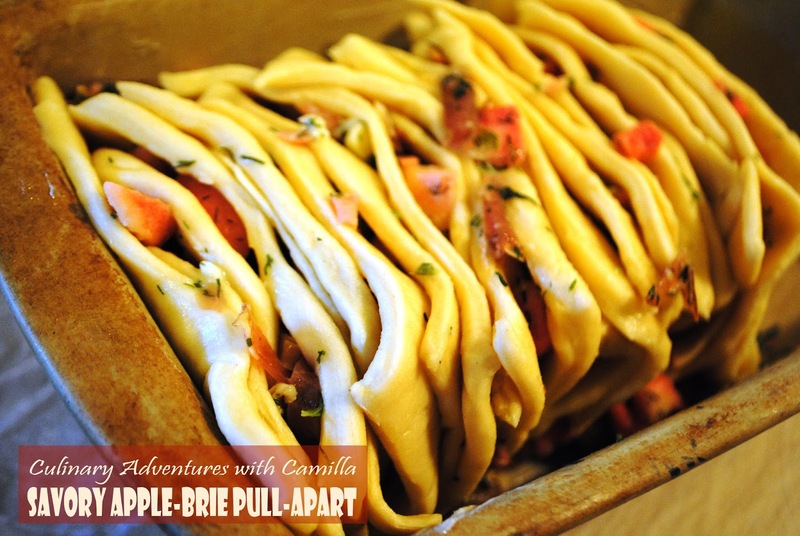 Thanks for introducing me to something new....Your pull apart apple brie bread is completely inspired and creative! I would happily eat about half the loaf, all by myself, in a closet, if I had the opportunity! Those pink apples are so pretty, and your bread sounds amazing!!! Mmmm, pull-apart breads are my faves! So much to like here, you've really inspired me to try this one. Thanks for sharing it. And those pink pearl apples are gorgeous! I'll have to keep an eye out for them. 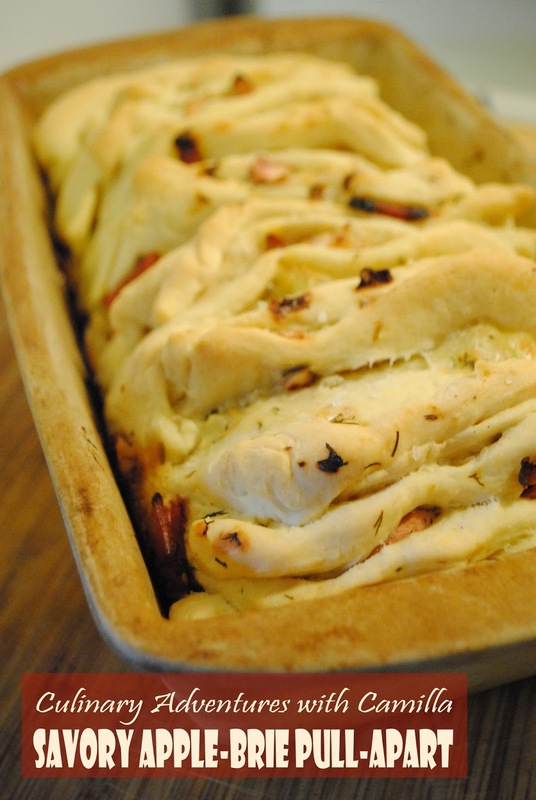 I can't quite imagine the flavor of the Curried Apple Butter, but my taste buds are jumping for joy anticipating this savory pull apart bread. 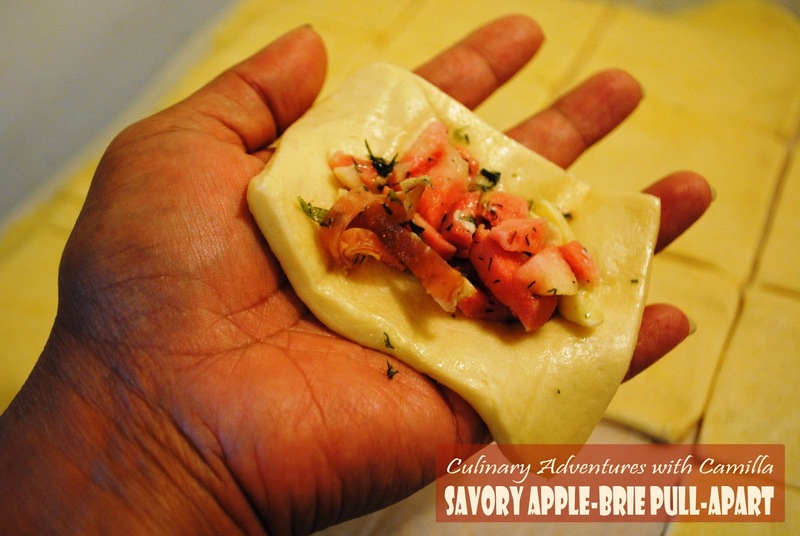 Apples, pancetta and brie in a warm dough wrapper - oh my, yes please.